Start at R 983 089 A where there is a decent carpark . 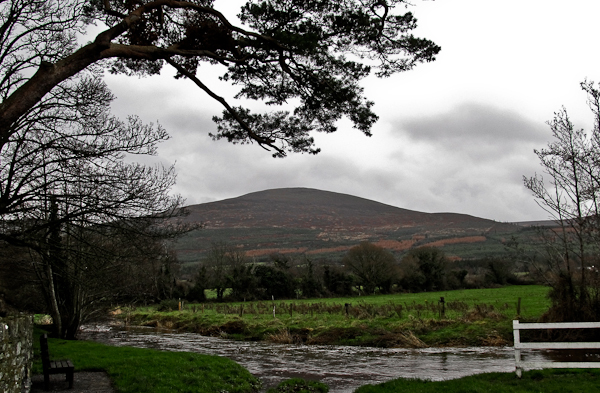 You can also turn north on the tarred road and walk 200 meters to where the Avondhu way crosses the road. Once on this rocky way follow it uphill for approx 2 kms until you gain a plateau at 600 mtrs elevation. The track at this point can be followed straight ahead(north) or to the right(west). 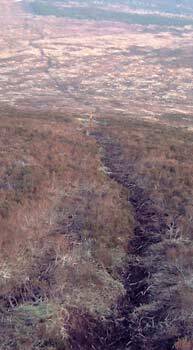 Turn right and cross the plateau until the track starts to go downhill again at a waymarked way post. Turn north here for the summit co-ordinates. This gives you the easiest line of ascent to the summit. Manmade standing stones are visible around the trig pillar with a massive stone mound behind. 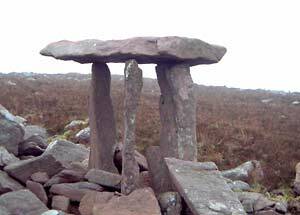 This was known locally as the heap of stones, above the valley known as the Prisun. Nice walk today, Started at carpark above Bay Lough (plenty of parking) at S031101 B B, from there follow the Avondhu way west (head towards statue west of carpark to get started) as far as S016097 C C C, you are now leaving county Waterford and entering the Premier County. On the way to S016097 C C C you'll pass on old broken style at the edge of a forest at S022094 D D, this is where you'll rejoin the Avondhu way from the top of Knocknalougha. From S016097 C C C follow the posts to the top of Knockshanahullion S000105 E.
From the trig point at the top of Knockshanahullion, head for the top of Knocknalougha S020100 F, this isn't terribly steep, but can be very slippery, be warned, I almost ended up on my a** a few times. 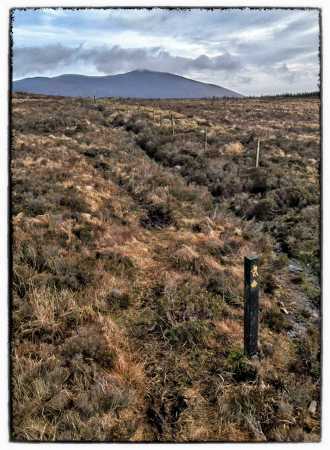 When heading towards Knocknalougha, if you encounter a fence running east-west, keep it on your right it will lead you almost all the way to the flat, fairly uninteresting summit, now stop and enjoy the views (30m visibility today so no views for us). From the summit head south to S022094 D D and retrace your steps to the car park. 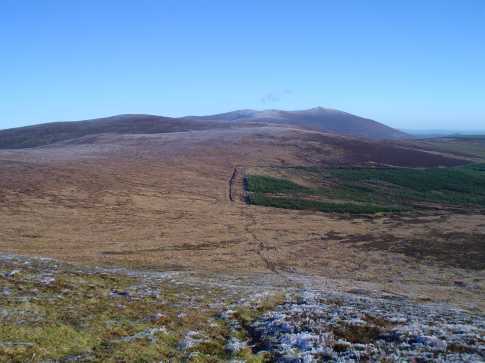 The Eastern Knockmealdowns viewed from Knockclugga near Knockshannahullion.